Here are some snazzy birthday facts about 24th of October 1944 that no one tells you about. Don’t wait a minute longer and jump in using the content links below. Average read time of 10 minutes. Enjoy! What day was my birthday Oct 24, 1944? October 24, 1944 was a Tuesday and it was the 298th day of the year 1944. It was the 43rd Tuesday of that year. The next time you can reuse your old 1944 calendar will be in 2028. Both calendars will be exactly the same! This is assuming you are not interested in the dates for Easter and other irregular holidays that are based on a lunisolar calendar. There are 188 days left before your next birthday. You will be 75 years old when that day comes. There have been 27,205 days from the day you were born up to today. If you’ve been sleeping 8 hours daily since birth, then you have slept a total of 9,068 days or 24.83 years. You spent 33% of your life sleeping. Since night and day always follow each other, there were precisely 921 full moons after you were born up to this day. How many of them did you see? The next full moon that you can see will be on April 19 at 11:14:00 GMT – Friday. Fun stat: Your first one billion seconds (1,000,000,000) happened sometime on July 2, 1976. If a dog named Dido - a Komondor breed, was born on the same date as you then it will be 388 dog years old today. A dog’s first human year is equal to 15 dog years. Dogs age differently depending on breed and size. When you reach the age of 6 Dido will be 45 dog years old. From that point forward a large-sized dog like Dido will age 5-6 dog years for every human year. Dwight D. Eisenhower pledges United States support to South Vietnam. Nezar Hindawi is sentenced to 45 years in prison, the longest sentence handed down by a British court, for the attempted bombing on an El Al flight at Heathrow Airport. After the verdict, the United Kingdom breaks diplomatic relations with Syria, claiming that Hindawi is helped by Syrian officials. Italian prime minister Giulio Andreotti reveals to the Italian parliament the existence of Gladio, the Italian “stay-behind” clandestine paramilitary NATO army, which was implicated in false flag terrorist attacks implicating communists and anarchists as part of the strategy of tension from the late 1960s to early 1980s. What does my birthday October 24, 1944 mean? Your birthday numbers 10, 24, and 1944 reveal that your Life Path number is 7. It represents analysis, awareness and understanding. You are the searcher and the seeker of the truth. The following celebrities also have the same life path number: Iain Morris, Juliet Stevenson, David Rendall, Debby Boone, Bruno Nogueira, Germán Magariños, David Marks, Ninet Tayeb, Lawrence Gray, Kristian Bush. What is the birthday horoscope for Oct 24, 1944? The Western zodiac or sun sign of a person born on October 24 is Scorpio ♏ (The Scorpion) – a fixed sign with Water as Western element. The ruling planet is Pluto – the planet of transformation. According to the ancient art of Chinese astrology (or Eastern zodiac), Monkey is the mythical animal and Wood is the Eastern element of a person born on October 24, 1944. Fun fact: The birth flower for 24th October 1944 is Cosmos for constancy. 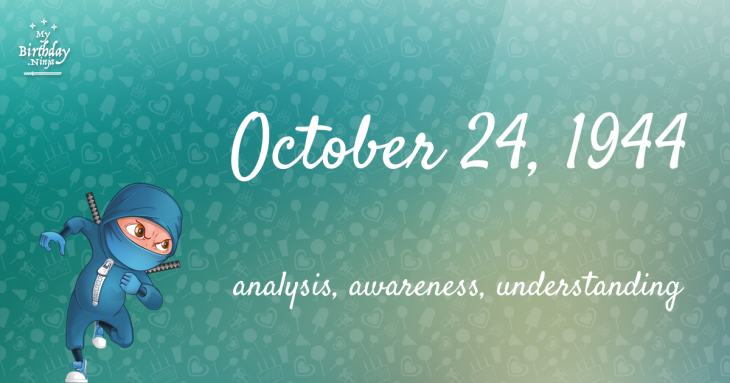 What is the Love Match for Oct 24, 1944? When it comes to love and relationship, you are most compatible with a person born on February 19, 1946. You have a Love Match compatibility score of +99. Imagine being in love with your soul mate. On the negative side, you are most incompatible with a person born on April 18, 1936. Your incompatibility score is -156. You’ll be like a cat and a dog on a love-hate relationship. Arf-arf, I want to bite you. Meow-meow, stay away from me! What is the popular baby name on 24 Oct 1944? Here’s a quick list of all the fun birthday facts about October 24, 1944. Celebrities, famous birthdays, historical events, and past life were excluded. 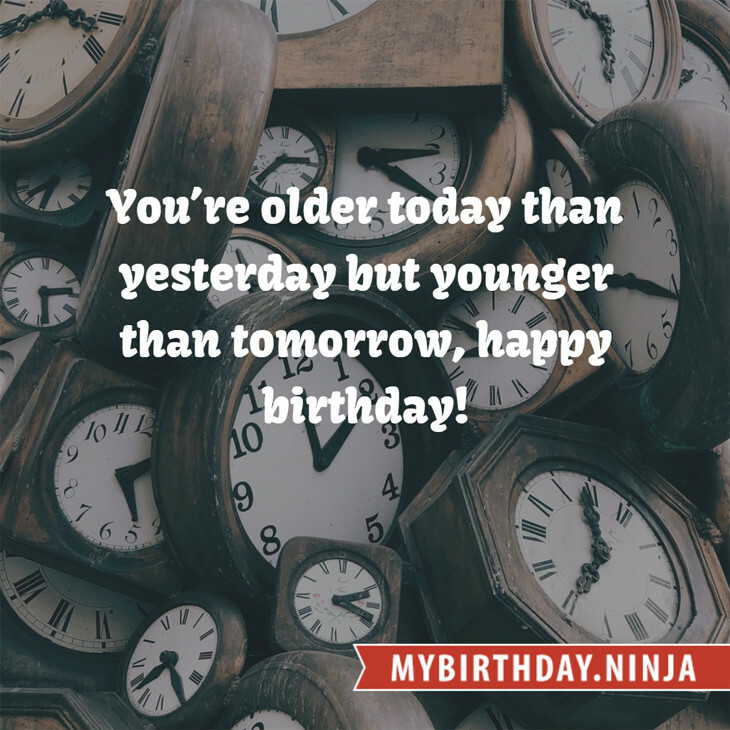 Try another birth date of someone you know or try the birthday of these celebrities: November 24, 1966 – Russell Watson, English tenor and actor; November 28, 1970 – Richard Osman, English television host, director, and producer; November 4, 1919 – Martin Balsam, American actor, director, and screenwriter (d. 1996).